Personally, I have been using Google Reader for some time now. Overall I have been happy with it’s performance, but isn’t very integrated into my daily workflow. Even still, the price has always been right – FREE! Among the various free feed readers out there, Google Reader has worked best for me. Ironically enough it was Google that tipped me off on the real intent of this post. A visit to Google News revealed to me both NewsGator & Feed Demon have been made into free downloads. The NewsGator group of programs has for a long time been celebrated as one of the best paid feed readers out there. Today however, that all changed when NewsGator made each of the following products FREE! 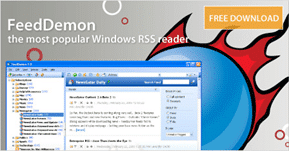 NewsGator Online (Free before today) – Free online feed reader. Free Tools – Again, free before today, but I figured I’d mention it anyway. Go get yourself a top-notch feed reader for free, and then come back here to The CAD Geek to subscribe to my feed (if you haven’t already)! Finally if you’re looking for some other blogs to add to your flashy new feed reader check out some of the links on the right. Shaan Hurley of Autodesk has a much longer and more complete list on his blog.